Powers/Abilities: Jack Winters could telepathically communicate with others and was resistant to psychic attack. He could teleport himself and others miles away, though he appeared to lose that power after being mind-blasted by Xavier. His hands were composed of a flexible diamond-like substance that was virtually indestructible. In addition to possessing superhuman destructive power, he also appeared to be superhumanly strong (Enhanced human). Weight: (Winters) 198 lbs. ; (Jack O'Diamonds) 208 lbs. ; (Living Diamond) 592 lbs. (X-Men I#40/2 (fb)) - Jack Winters was a worker at a nuclear power plant. Not making enough money to pay off his gambling debts, he decided to steal some of his boss's radioactive materials and sell them back to him. One of the flasks he was attempting to steal exploded, and Winters escaped without getting caught, after which he spent a couple weeks in a hospital. Several nights later he began to detect brainwaves and he found that his hands had transformed into flexible diamond. (X-Men I#40/2 (fb) - BTS) - Winters decided that a more powerful dose of radiation would turn his whole body into diamond and possibly increase his psychic powers as well. He plotted to recruit another mutant to help him. (X-Men I#39/2) - As Scott Summers fled from pursuers after first using his powers in public, he came upon the shack of Jack Winters who sensed his presence and psychically summoned him into the shack as well. When Scott entered, Winters told him that he, too, was a mutant, and that they were born to rule. (X-Men I#40/2) - Winters explained what mutants were to Summers, after which he sensed approaching police and teleported Summers and then himself somewhere outside West Chester county New York. Winters then shared his origins and told Summers his alias of Jack O'Diamonds. Winters threatened to kill Summers if he refused to assist him in increasing his power, but Professor X--having been tracking Summers with his computer Cyberno--mentally tried to convince Winters to abandon his quest for power. Professor X confronted Winters who ordered Summers to blast him, but Summers refused, not wishing to kill the man. Professor X found that Winters' mental powers protected him from psychic attack, and Winters moved forward to destroy him. (X-Men I#41/2) - Unable to overcome Xavier's powers completely, Winters could not grab Xavier himself, so he again ordered Summers to blast him, and Summers again refused. Winters then smashed a support girder and hurled it at Xavier, but this caused the roof to cave in, and they fled. His teleportational ability apparently lost in Xavier's attack, Winters led Summers to the plant, and Summers blasted a guard's gun to prevent Winters from hurting the man. Winters then rushed into the plant and exposed himself to the energies of a cyclotron. Professor X arrived outside the plant and subdued the other guards attacking Summers, and Winters continued to increase his power until he burst through the wall of the plant, now a Living Diamond. (X-Men I#42/2) - Winters confronted Summers and Professor X, ignoring the latter's efforts to convince him to give up so he could help him. Professor X's mental bolts could not penetrate the Living Diamond's body, and Winters prepared to smash Xavier until Summers blasted Winters back. Summers and Professor X fled into the plant and located an Ultrasonic Vibration-Inducer just seconds before Winters smashed the door down. With Xavier's guidance, Summers trained the Vibration-Inducer on Winters, which made it harder for Winters to move. Winters resisted fiercely and his struggle against the vibrations caused his body to explode, leaving nothing behind. (She-Hulk II#34 (fb) - BTS) - Apparently Winters body was somehow recovered, and his corpse was buried. (She-Hulk II#34 (fb) - BTS) - Winters' corpse was claimed by the Black Talon, who dressed it in an X-Men-type uniform. (She-Hulk II#34) - The Black Talon raised the Living Diamond as zombie to serve in his X-Humed, alongside the Black Bishop, the Changeling, and Scaleface. (She-Hulk II#35) - The Living Diamond zombie fought alongside the X-Humed against She-Hulk who injured her hand by punching him. The Black Talon suggested he might now be better known as the Dead Diamond. After further struggle the Black Talon fled with his X-Humed, but the Changeling alerted police they passed by taking the form of Elvis Presley, and She-Hulk followed the reports to locate them. She caused the Black Talon's hearse to wreck and she captured the Black Talon. (She-Hulk II#35 - BTS) - She-Hulk permanently laid the X-Humed to rest by filling their mouth with salt and stitching their lips together (though how she would have stitched diamond-hard lips together is beyond me) before re-burying them. Comments: Created by Roy Thomas, Werner Roth, and John Verpoorten. 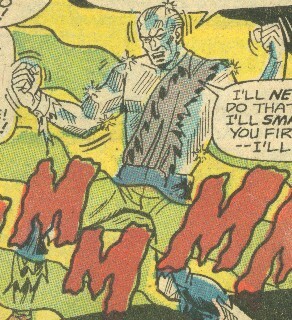 Winters never had any powers until he was exposed to the radiation that turned his hands into diamond, after which he gained telepathy as well. Doesn't really fit the standard definition of mutant, but I guess his mental powers could have been dormant and just surfaced during the stress of his radiation exposure. Jack O'Diamond's quote "I've still got hammering fists of solid, flexible diamond!" 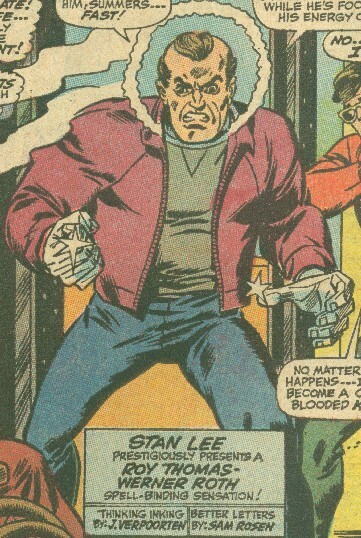 Jack Winters, a latent telepathic mutant, after deliberate exposure to nuclear energy became a humanoid with an indestructible, crystalline body. But, in light of the ret-conned origins of Man-Wolf, Ulysses Bloodstone, the Basilisk, and--most importantly--the Blue Diamond of WWII, I have to wonder. Could Winters' reactor have been powered by one of those alien power gems from the "Tree of Life?" Considering that they've both had a combination of living diamond and mental powers (even if only temporary in Jack's case), perhaps there's some unexplored connection between Emma Frost and Jack Winters aka the Living Diamond? 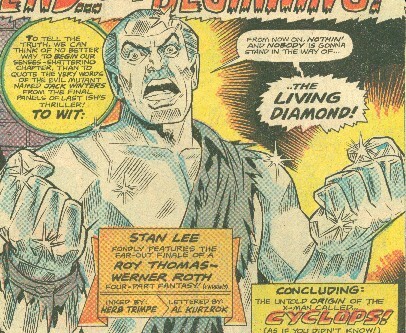 Jack O'Diamonds/Living Diamond has an entry in Marvel Legacy: The 1960s Handbook.